Let’s return to the problem mentioned in the chapter Introduction: callbacks: we have a sequence of asynchronous tasks to be done one after another. For instance, loading scripts. How can we code it well? Promises provide a couple of recipes to do that. In this chapter we cover promise chaining. The idea is that the result is passed through the chain of .then handlers. Then the .then handler is called (**). As the result is passed along the chain of handlers, we can see a sequence of alert calls: 1 → 2 → 4. The whole thing works, because a call to promise.then returns a promise, so that we can call the next .then on it. When a handler returns a value, it becomes the result of that promise, so the next .then is called with it. The value returned by .then is a promise, that’s why we are able to add another .then at (2). 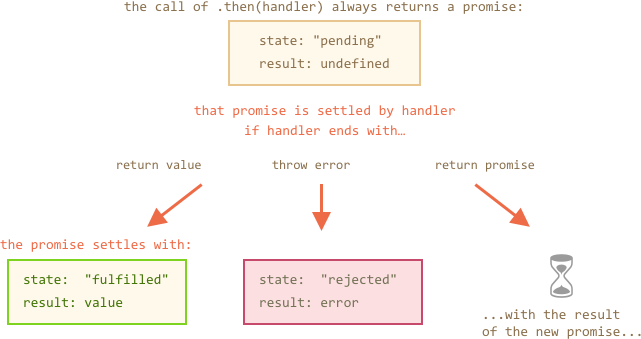 When the value is returned in (1), that promise becomes resolved, so the next handler runs with the value. A classic newbie error: technically we can also add many .then to a single promise. This is not chaining. What we did here is just several handlers to one promise. They don’t pass the result to each other, instead they process it independently. All .then on the same promise get the same result – the result of that promise. So in the code above all alert show the same: 1. In practice we rarely need multiple handlers for one promise. Chaining is used much more often. Normally, a value returned by a .then handler is immediately passed to the next handler. But there’s an exception. If the returned value is a promise, then the further execution is suspended until it settles. After that, the result of that promise is given to the next .then handler. Here the first .then shows 1 returns new Promise(…) in the line (*). After one second it resolves, and the result (the argument of resolve, here it’s result*2) is passed on to handler of the second .then in the line (**). It shows 2 and does the same thing. So the output is again 1 → 2 → 4, but now with 1 second delay between alert calls. Returning promises allows us to build chains of asynchronous actions. Here each loadScript call returns a promise, and the next .then runs when it resolves. Then it initiates the loading of the next script. So scripts are loaded one after another. We can add more asynchronous actions to the chain. Please note that code is still “flat”, it grows down, not to the right. There are no signs of “pyramid of doom”. This code does the same: loads 3 scripts in sequence. But it “grows to the right”. So we have the same problem as with callbacks. People who start to use promises sometimes don’t know about chaining, so they write it this way. Generally, chaining is preferred. Sometimes it’s ok to write .then directly, because the nested function has access to the outer scope. In the example above the most nested callback has access to all variables script1, script2, script3. But that’s an exception rather than a rule. To be precise, .then may return an arbitrary “thenable” object, and it will be treated the same way as a promise. A “thenable” object is any object with a method .then. The idea is that 3rd-party libraries may implement “promise-compatible” objects of their own. They can have extended set of methods, but also be compatible with native promises, because they implement .then. This feature allows to integrate custom objects with promise chains without having to inherit from Promise. In frontend programming promises are often used for network requests. So let’s see an extended example of that. This makes a network request to the url and returns a promise. The promise resolves with a response object when the remote server responds with headers, but before the full response is downloaded. To read the full response, we should call a method response.text(): it returns a promise that resolves when the full text downloaded from the remote server, with that text as a result. There is also a method response.json() that reads the remote data and parses it as JSON. In our case that’s even more convenient, so let’s switch to it. Now let’s do something with the loaded user. The code works, see comments about the details, but it should be quite self-descriptive. Although, there’s a potential problem in it, a typical error of those who begin to use promises. Look at the line (*): how can we do something after the avatar has finished showing and gets removed? For instance, we’d like to show a form for editing that user or something else. As of now, there’s no way. To make the chain extendable, we need to return a promise that resolves when the avatar finishes showing. Now right after setTimeout runs img.remove(), it calls resolve(githubUser), thus passing the control to the next .then in the chain and passing forward the user data. As a rule, an asynchronous action should always return a promise. That makes it possible to plan actions after it. Even if we don’t plan to extend the chain now, we may need it later. If a .then (or catch/finally, doesn’t matter) handler returns a promise, the rest of the chain waits until it settles. When it does, its result (or error) is passed further. Are these code fragments equal? In other words, do they behave the same way in any circumstances, for any handler functions? That’s because an error is passed down the chain, and in the second code piece there’s no chain below f1. In other words, .then passes results/errors to the next .then/catch. So in the first example, there’s a catch below, and in the second one – there isn’t, so the error is unhandled.